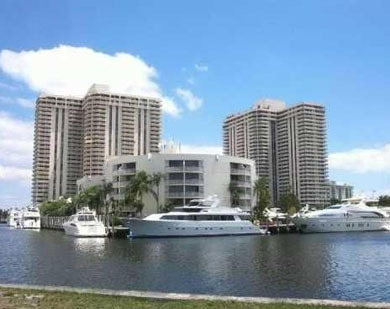 Turnberry Isle's Turnberry Marina condo features 150 Aventura condos for sale within a building that strongly emphasizes an island resort living experience complemented by the dynamism of the city of Aventura itself and the incredible vistas you'll only find among condominiums in sunny South Florida. Exploring Turnberry Marina's amenities, you'll discover casual and formal dining facilities, a gym, swimming pool, spa, a number of personal services and the many activities and sights that are strewn throughout Turnberry Isle itself. The units of Turnberry Marina are available with 1,520 to 5,550 square feet and have wraparound terraces as one of many residential features. Go sailing from Turnberry Marina or explore everything that the city of Aventura has to offer. Popular Aventura Mall is around the corner from the building and has various stores plus an IMAX theater and restaurants like Cheesecake Factory. The beaches are to the southeast in Sunny Isles Beach or you may decide to explore the sands of Hallandale Beach and Hollywood.